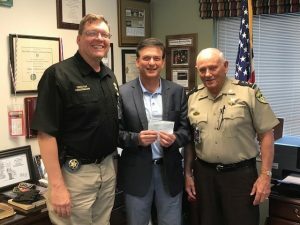 Chatham County Sheriff’s Office, Chief Deputy Billy Freeman and Director Todd Freesemann, continued the tremendous generosity for the family members we proudly and honorably serve. Sheriff Wilcher and his dedicated team have now purchased 160 tickets for the Red White and Blue Baseball Night hosted by the Savannah Bananas. Please join us and follow their lead by purchasing tickets for this great event to be held on June 1st. To purchase tickets click the below button, or email us at info@twohundredclub.org for more information. Support the families of our fallen first responders!